On a snowy day like today, maybe I’ll dust off the old sewing machine! Nah, I’ll probably paint instead! Oh how I love this, wonderful illustration! I love your take on “dusty”. What a wonderful art quilt! I left you a little blog-love over at my place! Hey there Krista, For some strange reason I feel the need to quilt and sew so badly right now! he he he he he! Oh this is wonderful. I just want to wrap it all around. How wonderful!!!! Great work. Thanks so much for stopping by with your warm comments. You made my day girly. Thanks. Wow, I’m always blown away by your work, Krista! Gorgeous piece! My machine definitely has a thick layer of dust by now. Oh, wait. I gave it away. 🙁 Seeing this makes me want to sew again. This is beautiful! 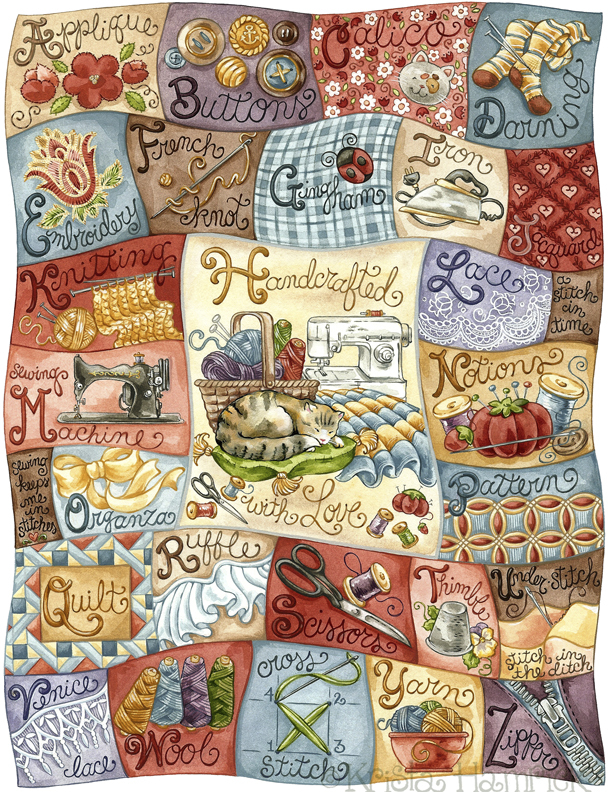 This should be a real quilt! The colors and textures are remarkable! Wow! Absolutely Beautiful – Gorgeous detail!! Beautiful piece! I don’t know how I missed your chickens, but they’re great too. Loved your memories on my blog. Thanks for visiting! This is just fantastic! Have you ever thought of licensing your work to a jigsaw puzzle maker. This would be a fantastic 1000 piece puzzle. Even if you aren’t in that frame of mind, I just love this painting and really wish it was a quilt! You know, your creations are so uplifting. Have you ever thought of designing a baby book, or a journal? Beautiful work! I love all the little details! oh this is gorgeous Krista!!!! what a beauty!!! I love this quilt of art. it would look great as a poster in a studio. I used to sew when my kids were babies. For some reason, I could keep the sewing machine out and it worked. I made a lot of quilts. Now though, I can leave the paints and ink and all that out, as long as the dog stays off my art table.